Starting next week, Buzzr is showcasing a week of pilots and other rarely-seen goodies under a new block of shows called Lost and Found. 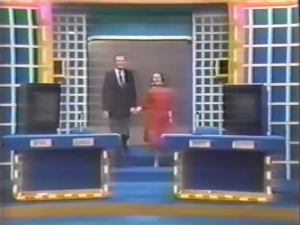 In preparation of that, Buzzr has let us watch the unaired pilot of a show called Star Words. This is what we’ve learned. Christian: Star Words, created by Steve Ryan of Blockbusters fame, is an amusing idea. The concept of picking pairs of words and hoping your partner makes the same connection between them that you made seems like a logical evolution of the Match Game format, and the unpredictability of the gameplay lends Star Words some comedic promise. Bob: So, Star Words. I don’t know where to start with this. I’m getting vibes of Password Plus puzzles and the Match-Up round from Match Game in the early 1990s. Cory: Star Words is about 75% of the way of figuring out all its ideas, from gameplay to hosting to set design to everywhere in between. As a game show fan, it’s fascinating to peek into this process. Presumably, this game was tested and retested, then presented to a company, who decided to go forward and build a set and hire some writers and call Nipsey Russel and take a day to create a video that would sell this show to networks. But, like, this? Really? Christian: The game boards, while serving the purpose of displaying words reasonably well, were lacking in color and personality. The set had a very Microsoft Excel feel about it. Considering this pilot was shot the same year Plinko made its debut on The Price Is Right, it’s obvious that the CBS art department could have done better, or at least brighter. Bob: There’s just not enough game here to make it entertaining. The pace is very slow, especially with revealing one word at a time in the first two rounds. It doesn’t offer any meaningful strategy. The third round at least shows all the words at once, and you just have to attempt to run the board as far as you can, which isn’t as bad. Christian: The Tattletales-style monitors on the contestant desk seemed a bit superfluous, considering how much it, in my opinion, hindered the home viewers’ ability to get to know and root for the civilian players. It’s hard to get to know a contestant if they appear in person for less than 4 minutes of the total program run time. Cory: Match Game worked really well because the construct of the game was so light and bare-bones that you needed six celebrities, including two or three very bombastic or clever celebrities, to carry the proceedings. Star Words is similar in that the construct of the game was very bare-bones, so the celebrities playing needed to be very clever. Picking Charles Nelson Reilly to be a celebrity player was a good idea. Patty Duke-Astin felt out of place and overwhelmed. Christian: By far, however, the worst part of Star Words was host Nipsey Russell. 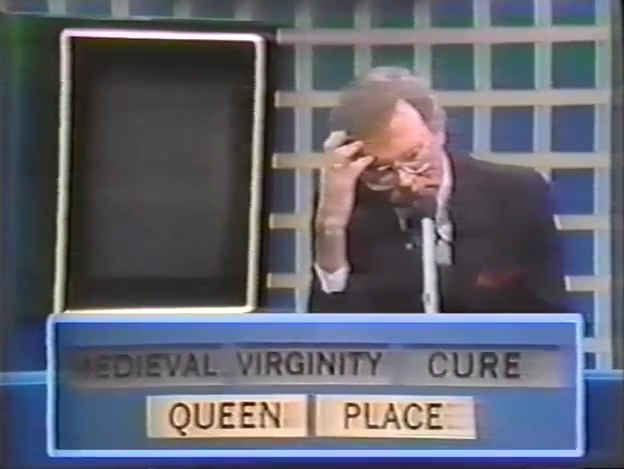 While he did shine on game shows of the 70s and 80s as a panelist, his hosting of a pure game show like Star Words was stilted, awkward, and unfunny. Nipsey is clearly a people person, and his genuine joy to be at the helm of his own show is sweet to watch, but I think his skills as an emcee needed more time to gel. The apparent lack of editing on this show didn’t do our Poet Laureate of Television any favors, either—several times throughout the show, Nipsey does his best impression of a deer in headlights as he anxiously awaits correction of his rule explanations. Bob: The bonus round is very subjective because you can have multiple matches to a single answer, but you are really going after what’s written on the card. The celebrity mechanism can be entertaining if done right, but jokes fall flat in all directions and it feels like everyone is trying to find a joke combination at every possible corner. I’m pretty sure Nipsey doesn’t know what’s going on either, and it seems like he’s just there to get a paycheck. Cory: It’s utterly fascinating to see these pilots just for what they represent: an effort. A spark. A starting point of a new chapter in the encyclopedia of game shows. But that effort here was for naught. As a Cards Against Humanity-type board game, this would be an amazing show. 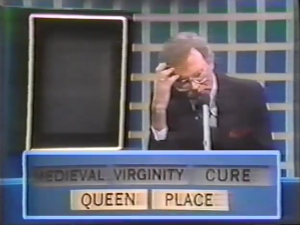 But as a game show, helmed by Nipsey Russel, it was a mess. A lot of the production choices confused me. The gameplay never felt smooth or solid. Bob: In the end, Star Words comes up short. It fits better as a mini-game somewhere, but as a 23-minute program, it gets stale real fast. Christian: Other than Nipsey’s hosting and the drab set, I felt the biggest problem with Star Words was the cold, sterile feeling of the interactions between the contestants and their celebrity partners, due to them being separated by a TV monitor. This could have easily been solved by keeping all four players on stage, and having the players write their connections down on cards. At that point, however, you’ve essentially re-invented Match Game, so why bother? Buzzr’s Lost and Found week block starts Labor Day at 8 PM and lasts all week. 25% more forethought and different production and direction choices probably could have brought this pilot to market. But to see it—and see Buzzr’s whole block of pilots—is a fascinating look into what doesn’t make it to air.